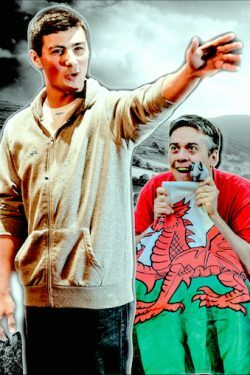 Odd Man Out, showing at The Hope Theatre, is a two tale offering of very different men inviting us to bear witness to the stories and confessions of pivotal moments in their lives. The first, Rabbitskin, written by Dominic Grace and affectionately performed by Luke Adamson is the story of Joe, a young man working out his place in his family and the world, following his mother’s death. After a slightly clunky start, Adamson finds fluidity to the jumps of Joe’s erratic and gently charming story telling. Adamson is evidently a capable performer, comfortably engaging in multiple roles with ease. Physically Joe’s awkwardness is consistently delivered but I was left wondering if certain, heavily repeated traits were the actor’s choice or director’s request. The biggest downfall was a tendency to play larger than the space required. At times this lead to a somewhat animated performance and a loss of the much needed intimacy between audience and performer, which is vital for a piece of this nature to fully hit all its emotional marks. With this in mind, I would be interested to see a stripped back, starker portrayal to allow us to engage more with the raw and deeply personal memories. The writing is well paced with beautiful visual detail, an ideal piece for a one-man performance. The time jump after the penultimate scene could have been utilised to fully cement the emotional journeys of the other characters and allow the final reveal the truly harrowing response it deserves. In Diary of a Welshcake by Lesley Ross, we quickly warm to the bubbling Ralph (Gregory Ashton) as he offers us Welshcake and asks us to stand for the National Anthem. His early acclamation that this is not theatre, nor stand-up, but a deeply personal story is a useful insight, however not really followed through. Ralph is Welsh, but doesn’t carry the accent. He is patriotic but spent much of his time in the Midlands before returning to Wales following a painful break-up with his Comic-Con wife. On his best friend’s advice he journeys to Hong Kong to teach English where he starts a bizarre relationship with one of his students which predicable ends in disaster. The final message of the piece is along the lines of finding oneself on a belated gap year. Unfortunately the performance, thoughts and storyline dart off in tangents that benefit neither the character nor the story. The emotions the audience should experience are utterly prescribed; a tragedy occurs, you should feel devastated or upset. You don’t. That said, Ralph is harmless and likeable, though it is in the embodiment of Ralph’s new flatmate Matthew (pronounced M-ugh-chew) that Ashton is at his strongest and most engaging. Overall these are two well contrasted pieces offering the audience the opportunity to engage in the full spectrum of human emotion.